Memorial Gift Poem Cherry Clock Remembrance Bereavement Comfort Loss of Loved one Poetry Condolences Show the person who loss a loved one you care with a sympathy personalized poetry Imperial cherry wood desk clock. A unique bereavement support remembrance memorial poem table desk clock for a person that loss a family member or friend. 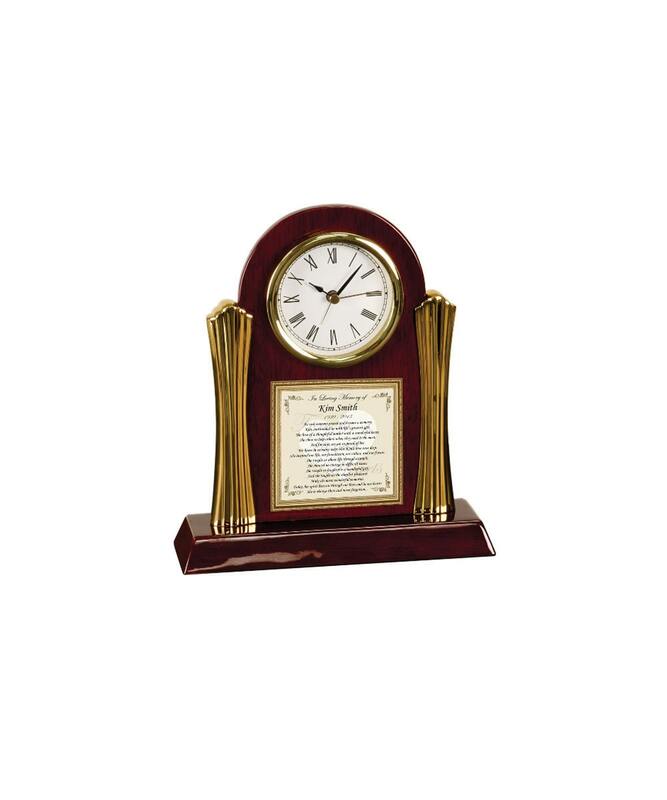 Make a caring impression for years to come with our elegant personalized condolences poem desk table clock. This customized desk clock is masterfully crafted out of rich cherry wood with gold columns. Beautiful design element numerals, a second hand, and deluxe quartz movement complete its display. A heartwarming sympathy gift clock decor for any setting. Whether a memorial gift to express comfort to a friend that have loss a loved one or a remembrance poetry present to support a family member during the grieving process, this stunning poetry clock gives a feeling of nostalgia and elegance. Remember loving bliss with the person that is in heaven with our tasteful and sincere poetry clock which makes a great memorial present. The loving poem imprinted on the body of the clock compliments the traditions use of contemporary designs. This sympathy poetry gift clock beautifully highlights the caring poem message that have sentimental value on your loving memories of your family or friend. 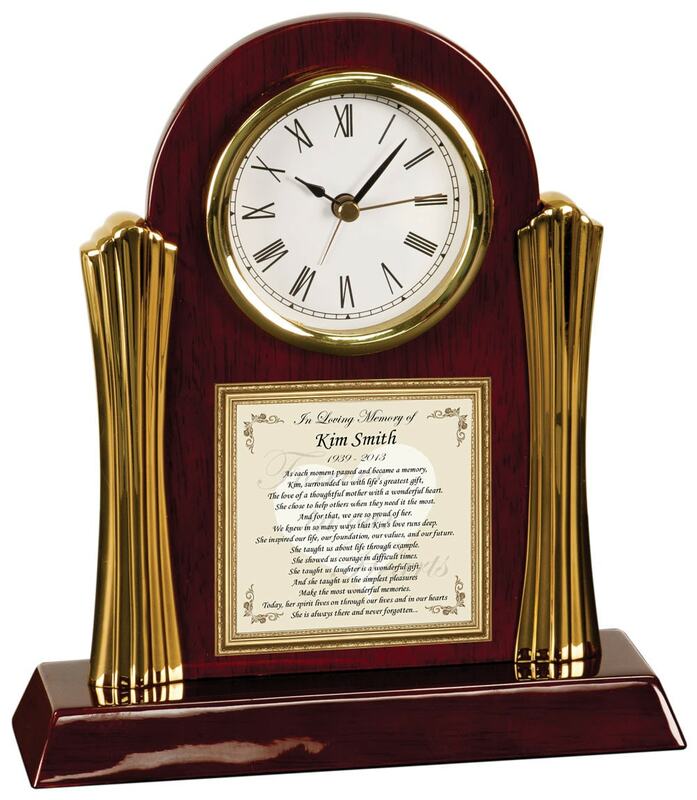 By fusing a timeless thoughtful poem into a table desk clock with a touch of customization, the end result is a really nice distinctive and unique keepsake memorial gift. Inspired by the remembrance words of our creative poets, these poetry gifts are an exclusive to AllGiftFrames.com creation. Our inspirational comfort poem table clocks, plaques and custom photo frames are customized with a unique sympathy poem embedded in the composition of the poetry clock or plaque gift. Let our bereavement gifts of poetry items imagination wander and explore the possibilities that you can create with a custom sentimental meaningful message in our elegant picture frames and clock gifts. 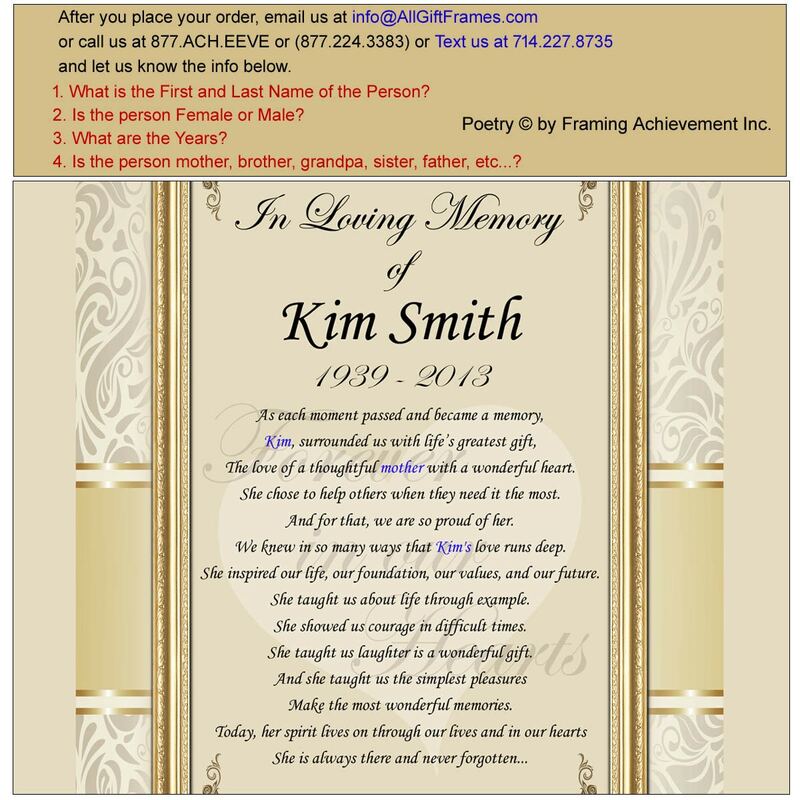 Rating high on style and elegance, Framing Achievement's personalized poem gifts are the first choice in premium poetry presents for Memorial, Birthdays, Weddings, Retirement, Graduation and many more occasions.